Do it yourself or “DIY” bouquets are a fantastic way to save money on a wedding, and to add a touch of the bride and groom’s personality in the process. When the bride and her team decide to go with DIY bouquets, they have complete hands-on involvement in the types of flowers to be used in the bride’s and bridesmaids’ bouquets. Plus, they eliminate the floral designer’s markup, which is often more than 100% of the cost of the actual flowers and supplies. With a little planning, some teamwork and some design guidance, anyone can make a beautiful wedding bouquet. No, seriously. Research (online) and select one or two types of flowers with hearty stems. You will often find many higher-end floral designers sticking with a monochromatic scheme or a play on that theme, with several hues of the same basic color. Often times, mixing a bunch of colors or different types of flowers of different lengths can quickly create a messy look. One exception to this rule is the country garden look, but you should tread with caution here. Avoid flowers with woody stems, as these are hard to work with. Also avoid flowers with flimsy stems that quickly turn into pulp. If you are unsure of the heartiness of the stem, ask the flower merchant before you buy. Gather a few cement buckets (or other buckets with deep wells) and go to the wholesale flower market in your area (Google it—they are usually in downtown, low-rent areas) a day or two (at most) before the wedding. You will get the best prices there. If you can’t find cement buckets, look for some when you get to the flower market. They will be all over the place. When you arrive at the flower market, get a flat cart. Go around with your cart and buy enough of the flowers you selected, so that each bridesmaid gets a nice, big bunch, then buy an additional ~10% or so, to allow for error. You should be able to eyeball it simply by gathering the flowers in your own hands. Put the flowers in the cement buckets on your cart. Then buy a big handful of flowers for the bride + ~10%. Her bouquet will probably be white or shades of cream, but many brides are opting to buck tradition and go for their own pop of color. Now find a vendor that sells floral supplies. Buy thick, satin-y ribbon in a coordinating wedding color, pearl-tipped corsage pins, and green, waxed floral tape if they have it. If they don’t have the floral tape, ask if you can have as many thick rubber bands as you have bouquets, x2. If they don’t have the rubber bands, you’ll have to drum them up from Office Depot or somewhere else. When you get home, put water in the cement buckets and store the flowers in a cool place until you’re ready to assemble the bouquets (Ideally the evening before or even morning of the wedding). Then, when you’re ready to assemble your first DIY bouquet, pull off the exess foliage (which will be almost all of it) and rotted or wilting petals. Shear off any thorns or unwanted branches with a stem cutter or very sharp knife. Then trim off the last two inches of the stems and put the flowers back in some fresh water for a minute or two to freshen them up. This is not their final cut, however—you will keep the stems long until the bouquet is bound. Now let’s assemble the bouquet. First, we start by creating a focal point in the middle. Choose 4 really beautiful flowers and arrange them in a square pattern. Make sure they are all rising up to the same height. This will become the center of the bouquet – the focal point – the rest of the bouquet will slope gently down and out from this point, sort of like a mushroom shape. Take the rest of the flowers, one by one, and arrange them around your focal point, sloping gently downward like the top of a mushroom. 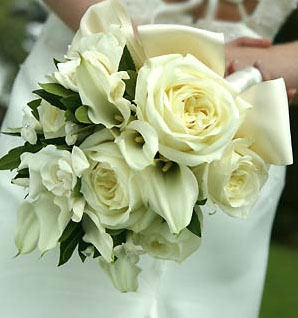 Do this, keeping the flowers firmly in your hand, until you are happy with the size and shape of your bouquet. To secure the bouquet in place, wrap the green floral tape (or rubber band) at the top of the bouquet. Make sure you don’t wrap so high that it appears you are choking the flowers, or so low that the bouquet falls apart or becomes loose. You will see a place where the stems seem to gently flow together and where the top of your hand rests when you assembled the bouquet. This is where to wrap. A good estimate might be 4” from the base of the flower heads. Then wrap again in the middle of the stems. Now you should have a pretty good idea of what your bouquet is going to look like. If you are not happy with the shape, now is the time to make minor adjustments. Ok, time to move to the final stage! Hold the stems under cool running water and trim the ends on an angle to a length of about 8 inches or whatever length you would like your final DIY bouquet to be. All stems should now be neatly trimmed to the same length. Measure a piece of ribbon that is about 2.5x the length of the stems of your bouquet. Trim the ends on a diagonal. Fasten the ribbon to the bouquet with a corsage pin. Wrap the ribbon tightly around the stems one time, so that it overlaps the first layer halfway. Push another pin through. Repeat with tightly wound satiny ribbon and pearlized pins, all the way down the bouquet. This will give the effect of the bouquet wearing buttons down its side. Another way to do this is to tuck the ribbon inside the bouquet or secure it with one pin. Then simply spiral it down and back up the length of the stems and secure it with a couple of pins. Either way can look elegant – it’s up to you. Once the bouquets are constructed, they should be placed back in buckets and stored in a cool place, and the flowers should be misted, if possible. Also, if you are working with roses and some of the rose heads are partially closed, you can simply blow them open. The first one may feel a bit tricky, but once you get the hang of it, anyone can make a DIY bouquet, really. So grab your fellow bridesmaids, a few big, ugly cement buckets, and take a trip on down to the flower market. You might discover a talent you never knew you had! There are lots of different methods for trimming your wedding expenses, but there is one way to do it AND have a little fun: save money with a signature wedding drink! Here’s how to do it with style. Destination weddings can be glamorous, memorable and really fun, but they can quickly get expensive. Here’s an insider tip that could save you some money on your dream destination wedding.